The downfall of the kingdom of Naples at the outset of the sixteenth century is a fascinating case history of European power politics, full of conflicts and complex interrelationships in the best Renaissance habit. It would be too hard recollecting all the facts and names in a few lines, but it is crucial to know a few information that would let understand the circumstances of the creation of the Cancionero the Upsala. As renowned, the illegitimate branch of the house of Aragon did not rule Naples long, only from 1442, with Alfonso I (the Magnanimous) to 1501, when Frederick III of Aragon was forced to abdicate, and like other ambitious lords of fifteenth-century Italy, the Aragonese found time to cultivate humanistic inclinations at their court. Firstborn of the last king Frederick and his second wife, the intelligent and cultured Isabella del Balzo, Fernando de Aragon (1488 – 1550) held the title of Duke of Calabria, as he continued to sign himself to the end of his days. Thanks to Charles V, he assumed the title of vice-regency of Valencia after the marriage with Germaine de Foix, the childless widow of Ferdinand the Catholic. After her deaths in 1537, Ferdinando married the cultured Mencia de Mendoza, becoming renowned for their patronage to arts and literature. The prestige, security and wealth that came belatedly but abundantly to the Duke of Calabria were bound to draw aspiring artists, writers and musicians to court his favour. The collection of villancicos known as the Cancionero de Upsala, published at Venice six years after the Duke’s death, is generally believed to have originated at his court. This explains why this Cancionero bears so many names: Cancionero del Duque de Calabria, Cancionero de Venecia and the last Cancionero de Upsala, due to its unique copy at the Uppsala University Library (Uppsala is the new name after the significant spelling reform of 1906.) The manuscript contains 70 pieces in total: 54 villancicos and 16 works for one and two voices. In Spain at that time, two types of secular vocal music were cultivated: unaccompanied polyphonic songs and solo with instrumental accompaniment: the villancico. The second form has been preserved principally in musical anthologies, the Cancioneros (as the Cancionero de Palacio, the largest and most celebrated among them), mostly still anonymous. The villancico was a closed form related to the medieval virelai with a tradition at least as old as the thirteenth century and perhaps more remotely of Arabic-Andalusian origin. By the period of the Cancioneros this choral dance song had crystallized in the musical form: A (refrain); B B (stanza); A (refrain). These compositions are evidence that Spanish composers were thoroughly familiar with the polyphonic practices of the Flemish School of the fifteenth century. They were settings of traditional Spanish forms and frequently polyphonic arrangements of traditional airs. The Spain Courts cultivated poets and musicians as well as their great successors of the Golden Age, creating a type of art which drew its vital substance from the folk tradition. All pieces of this Cancionero are mostly in Spanish and anonymous. A bunch of them are in Catalan, Latin and Galician-Portuguese and a very few villancicos has even an author (for example Juan del Encina, Mateo Flecha el Viejo, Nicolas Gombert) thanks to the first studies made by Rafael Mitjana in 1909 that recognized some of them. The Villancicos in the Cancionero de Upsala (Venice, 1556) represent the most excellent examples of the form. The best have a transparent contrapuntal texture, a phrasing sensitive to the peculiar qualities of Spanish verse rhythms and a remarkable feeling for harmonic colour and expression. With a taste rare at a time when musicians delighted in a show of the subtlest contrapuntal complexities, the composers of the Cancionero used a simple, straightforward polyphonic style, not always devoid of a certain awkwardness and archaic quality. Their interest was to set off rather than obscure characteristic turns of melody and rhythm and to intensify the poetic meaning of the text whether gay or melancholy, sentimental or satiric. Considerable literature of solo songs with instrumental accompaniment has been preserved in the very numerous collections of music for the vihuela. This Instrument shaped very like the guitar, with a narrow waist and a flat back, was designed, however, for the performance of complex contrapuntal music, such as was played more generally at the time on the lute. It had six, sometimes seven strings, some often being reinforced by a sympathetically vibrating string doubling at the octave to give more resonance. All the pieces presented in this cd are transcriptions for two vihuelas, a practice well known at that time and that constitute a rebuild of the tradition in the cancioneros performance. Pope, Isabel. 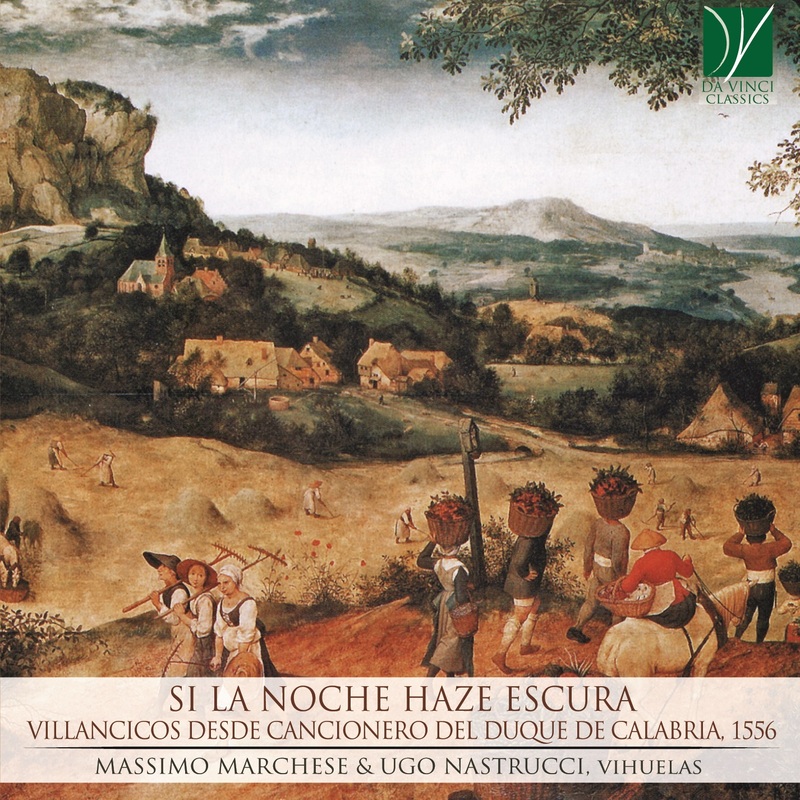 “Spanish Secular Vocal Music of The Sixteenth Century.” Renaissance News, vol. 2, no. 1, 1949, pp. 1–5. Nugent, George. “Jacquet’s Tributes to the Neapolitan Aragonese.” The Journal of Musicology, vol. 6, no. 2, 1988, pp. 198–226. To figure out how important was the transcription for vihuela of vocal pieces in Spanish music, it shall be sufficient to summarise the list of their compositions. In addition to original compositions for the instrument not derived from pre-existent vocal music, like Fantasies, Tientos, and sporadic dances, a large number of transcriptions survived, often derived from Flemish composers (Josquin more than anyone else): chansons, parts of Masses, Motets, Madrigals, even transcriptions from Spanish composers like Victoria, Morales and others. In the Libro Primero del Libro de música para vihuela titulado Orphénica Lyra by Miguel de Fuenllana, six out of twenty-two titles are original Fantasies for vihuela, only the 27% of the entire book. The remaining pieces are derived from pre-existing vocal compositions. In general, the Vihuelist composer-performer tends to transfer the vocal scores almost literally, even at the cost of forcing the performer to face “uncomfortable” passages. This practice was common in the Renaissance not only in Spain, as evidenced in other contemporary treatises such as Il Fronimo by Vincenzo Galilei. Massimo Marchese: Vihuela de mano, 6 course, by Anna Radice, Bologna 2010. Ugo Nastrucci Vihuela de mano, 6 course, by Sebastián Núñez, Utrecht, 2008. Massimo Marchese is known worldwide as one of the most refined performers of his generation. His long career allowed him to play and collaborate with many famous early music ensembles and to perform soloist concerts in several foreign countries. More than 18 record publications, among them 8 as soloist (RCA, Stradivarius, Tactus, Brilliant, Centaur, ecc. ), let Massimo Marchese be proud of one of the smartest curriculum concerning his instrument. He was very young when he first approached to the instrument: he met M° Jakob Lindberg, and he achieved a Diploma at the “Royal College of Music” of London then the specializations with Paul O’Dette, Nigel North, and Hopkinson Smith marked the beginning of his career. Since 1980 he played as soloist and continuo player performing for voices like Nigel Rogers and Furio Zanasi renewing, moreover, his collaboration with Jakob Lindberg (member of the “Dodekachordon” ensemble) in addition to other smart experiences with Enrico Gatti, Ottavio Dantone, and Flavio Emilio Scogna. During various tours he played in the most iconic music capitals in Italy and abroad; particularly noteworthy are his concerts for ”Oude Muziek – Lute Festival” of Utrecht, Centre National de la Recherche Scientifique – Sorbonne of Paris, Festival of Sacred Music of Tenerife and the Sofia Music Weeks. He has been Artist in Residence at the Osaka Italian Cultural Institute during summer 2016 (June and July), he participated in several RAI RADIO BROADCASTS (Radio 2, Radio 3 – Piazza Verdi and Radio 3 Suite – La Stanza della Musica (Music Room, ndt)) and Bulgarian National Radio. He has been the first lutenist in the world recording monographic CDs of Francesco Spinacino (Tactus, 2006), Franciscus Bossinensis (Tactus, 2004), Joackim Van den Hove (Brilliant Classics, 2015) and complete works in score (1682/1686/1716 ) of Robert de Visée (Brilliant Classics, 2011/2015). He worked in musicological research and held several lectures, bringing back to light composers like Gabriele Fallamero (1584). In 2003 he was lute professor at “A. Vivaldi” Conservatory of Alessandria (Early Music Department) and, from 1993 to 2000, President of S.I.E.M. (Italian Society for the Musical Education) in Alessandria. In 1997 he took part in the “landeskongress Schulmusik” in Stuttgart. He has been artistic director and musical consultant in several festivals like C.I.M.A.Al (Italian Centre of Early Music of Alessandria) in 2004 with which he organized and directed the European Festival of Early Music – Eastern Piedmont until 2014. Ugo Nastrucci, born in 1953, Milanese, is graduated in composition with Irlando Danieli and Giacomo Manzoni at the Conservatory "Giuseppe Verdi" of Milan. Contemporarily he has studied classical guitar with Massimo Lonardi, devoting himself to the historical performing praxis on early plucked strings instruments: he has frequented the course of lute held by Paul Cherici at the Conservatory of Milan and specialized at the seminars of Hopkinson Smith. He has deepened his studies of conduction of the orchestra with Simone Fontanelli, devoting himself to the direction of important works of the pre-romantic repertoire. As a lutenist and theorbo player he keeps both solo concerts and an intense activity as continuo player with various ensembles of early music among which "The Conserto Vago", ", "Europa Galante", "Ensemble Arte-Musica", the "Capella Leopoldina" and Domchor of Graz, Alessandro Stradella Consort", the Ensemble "Zefiro", "I Barocchisti" the "Accademia del Ricercare"; He has participated in numerous CD recordings, radio and television broadcasts (RAI, ZDF, ORF, Radio France). He has held concerts in the most important Italian festivals and in France, Switzerland, Austria, Germany, Holland, Belgium, Czech Republic, Spain, Croatia, United States, Mexico, U.K. It is author of stage music of various theatrical works and orchestral, choral, and chamber compositions. He teaches Harmony, Counterpoint and Composition at the Civico Istituto Musicale “Vittadini”, the Conservatory of Pavia, of which he has been the director from 1996 to 2000.